This villa is a great choice for any group of travelers. The villa is only a few minutes from Flamands Beach, has handicap access on the main level, and each bedroom can accommodate a king or two twin beds. The villa is within 10 minutes from several attractions and restaurants, so you can explore the island easily. There’s something for everyone here, in an open concept floor plan with a media room and gourmet kitchen. Alpaka perches on the Flamands hillside, located near the bakery, a restaurant, and Flamands Beach. This contemporary vacation home is built on two levels, with handicap access on the main level so anyone can enjoy St. Barts’ beauty. 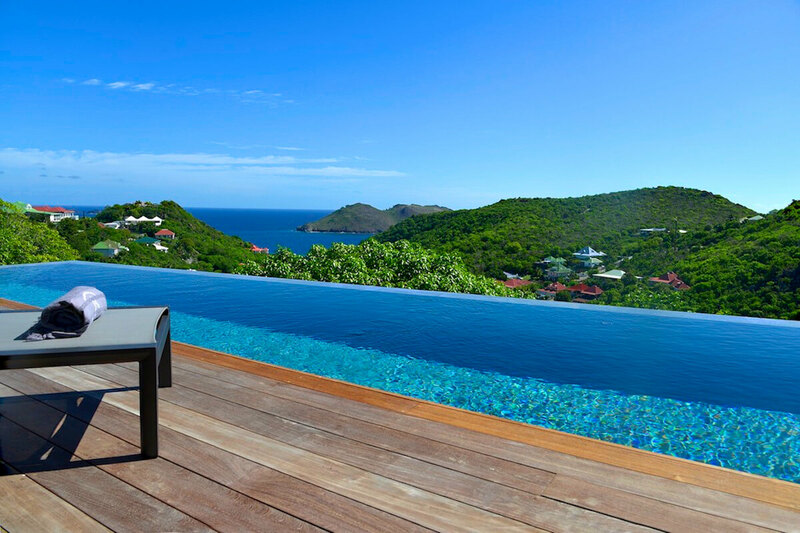 Take a dip into the infinity edge pool and gaze at the hillside and the sea. A wooden deck runs along the pool, with chaise lounges to relax in. Dine al fresco with an ocean view, or move to the indoor dining table. The open-concept main unit has a living room, media room, kitchen, and dining area. Any design lover will appreciate the artwork in the living room, and film junkies will enjoy watching movies on the flat screen TV. Chefs will fall in love with the modern kitchen, which has stainless steel appliances, a coffeemaker, and bar top dining. Each of the four bedrooms have their own terrace and ensuite bathroom. Each bedroom has a king-sized bed that can be converted into two twin beds, meaning that any group dynamic can enjoy Alpaka villa. Guests can lounge in their private seating area, study at the desk, or lean on the balcony railing and take in the view. The bathrooms are luxurious, with rain head showers, dual vanities, and chic design. Alpaka is only a short drive from Flamands Beach and it’s many restaurants. Villa guests have free access to the Form-Fitness gym in Lurin. Children and small pets can stay at Alpaka upon request, which makes this a great vacation home for any guest. Flamands Beach is a 3 minute drive. Daily French breakfast (French bread and croissants) during high season only.